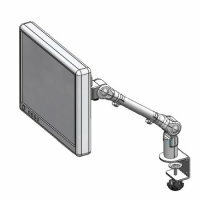 This C-clamp mount LCD monitor arm is designed to be small in size, lightweight, of high quality appearance and competitively priced. The design incorporates effortless height, tilt and rotation adjustment of the monitor. 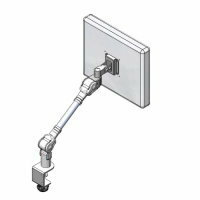 Ruggedly constructed from steel arm parts with plastic clip for monitor cabling. 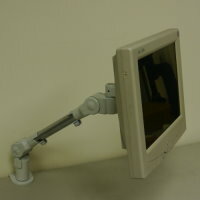 360° arm side to side rotation and 180° display side to side rotation. Models are available for loading range from 1kg (2.2 lbs) to 8kgs (18 lbs). Conform to the VESA 75mm or VESA 100mm hole patterns.